Two-Piece Set. 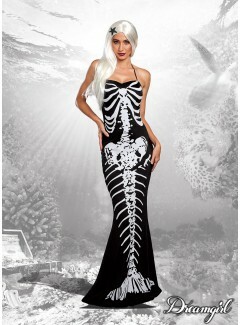 Dark meimaid gown with skeleton screen print and fin shaped hemline. Includes starfish barrette. (Shown With Style DG11689 Long Straight Layered Wig White Adjustable). Three-piece set. Black knit dress with front zipper and “S.W.A.T” screen print. Includes hat and police badge. Three-piece S.W.A.T. officer costume. Black knit dress with front zipper and “S.W.A.T” screen print; Hat; Police badge. Two-piece sailor costume. Navy and white satin polka dot romper with red sequin detailing and anchor appliqué. Includes sailor hat. See the full "Baku Collection 2018 / 2019" catalogue in PDF from your computer or tablet. Regarder le catalogue "Baku Collection 2018 / 2019" de votre ordinateur ou tablette.